This news item was posted in Pakistani News category and has 186 Comments so far . Elite Force guard Mumtaz Qadri, who confessed killing Governor Salman Taseer over blasphemy law, is a resident of Rawalpindi. Malik Mumtaz Qadri was born in Rawalpindi in 1985. In 2002, he was recruited in Punjab Police and was elevated to Elite Force in 2007. Seven months ago, he joined the squad deployed for security of Governor Taseer. Qadri’s father, a resident of Muslim Town, is a vegetable seller. The accused has five brothers and two sisters. He got married one year and four months back. Presently, he is residing in Yousuf Colony of Rawalpindi. 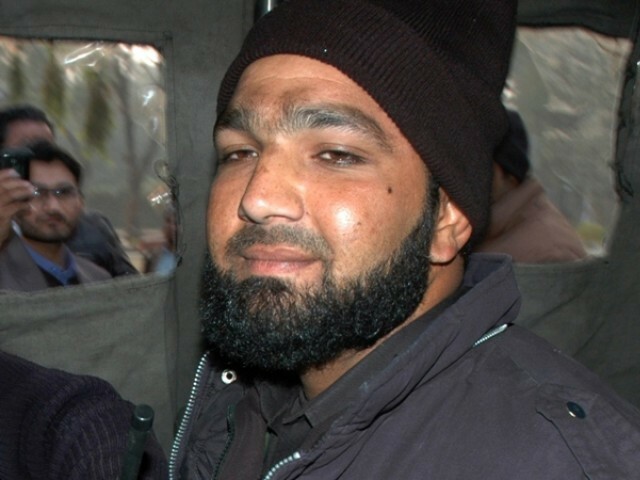 Mumtaz Hussain Qadri told his interrogators that he was angry over Salman Taseer’s opposition to blasphemy law. Immediately after the Taseer’s killing, a high-level investigation team has started a probe into the killing and arrested Qadri’s father and four brothers.. The telephone record of the suspect has also been acquired by the investigation team. Lunat tumaray ilm aur sooch pur Umair………………. Tum main her koi Alam bana pertha ………………. hai …………….aur ata alif nahi……………. Taseer was great man ………………..much better than mulahs ………………like u …………..
marna tu her kisi nain hai pur seena pur goli koi koi kahta hai. right is right even if every one is against it ,and wrong is wrong even if every one is for it..!! salman Taseer did no nothing only you people are so congested and knows nothing. There is no proof that he was blasphemer only so called molvees called him like this . In Islam everyone can not issue fatwa but in pakistan on friday every molvee who address on friday prayer issues fatwa. This is very bad tradition. In this way we can not run our country .Taseer said Zia made law is black law . this law is not divine law so amendment can be made according to Quran and Sunnah . By the if you are so Carey about law so why Qadri killed him come in courts and file your case . Justice Iftikhar is you have own justice in Supreme court and these courts are supported by most of molvees like jamat e Islami. dear brother and sisters mumtaz qadri has done as he think? but now what r we doing?we should know our respoonsibilities.what we should do for islam.so plz think and play important role for the betterment of islam and pakistan.because we r muslims. now we should start protest for the safety of mumtaz qadri. I really wonder why many see him as a hero. He murderd Taseer, right? Those tolerating a murder, are certainly no religious people. This cant be the true face of muslims… just a bunch of idiots, trying to save Islam. But in my eyes a religion cant be protected by force. Or are those guys keen on the virgins after life?!? Actually the clerics agenda is working in Pakistan . In 1977 they used Islam against Bhutto and agitated a movement and destabilized the democratic govt of Pakistan Do not forget the Zia Islamization which was backed by these clerics ( molvees). After that they joined hands with General Zia in Govt and remained in Govt for 11 years . During that govt these clerics passed certain law including the Blasphemy law . Whatever this was the beginning of bad era in Pakistan after that our country never stabilized . They enjoyed the assassination of Benazir Bhutto . Now they got a good chance to agitate a movement with name of Namoosay e Rasalat against govt. They are using “Islam to get govt and control of Pakistan . This is only agenda on which they are working using religion in bad manners . Even this self define Islam the real Islam is far away from Pakistan. Even these clerics have no respect for Quaid i Azam . They said him Kafir and Shia. This is point to think otherwise whole nation will be in difficulties . There is nothing for Qadri whatever he did on his own behalf or backed by someone . Atleast brainwash by some clerics in Friday addresses. This is only reason they supported Qadri and say him a Hero to get the objectives of political agenda. Plz visit mumtazqadri.net for more information about Namoos e Risalat and Mumtaz Qadri case. akistan mein sab terrorist Tanzims and parties per action lia gia,Laikin aik baat samaj nahi aati kay MQM per action kiun nahi lia gia.Pakistan Karachi mein agar aman chahta hey to MQM ko khatam kerna ho ga.sab Pakistani aur Karachi walay log bhi jantay hein MQM kay baray mein phir iss parti ya tanzim kay khalaf action kiun nahi jata.Urdu,punjabi sindi balochi yeh sara intishaar MQM ka Phailaya howa hey.Sari duniya jaanti hey karachi mein jitni bhi Qatalo gharit hoyee aur ho rahi hey,Iss mein MQM kisi na kisi tarah malawash hey.phir Govt ya Aala hukkaam iss kay khalaf arsa daraaz sey action kiun nahi ley rahay.Ta kay Mulak mein Aman ho sakay.ab yeh terrorasim sirf karachi tak mahdood nahi raha ab yeh ahista aahista dosray cities mein bhi aa raha hey.har doray hukomat mein MQM ko tarjeeh de jati hey pata nahi kiun.jab kay sab jantay hey iss jamaat kay baray mein.phir kia waja hey kay koi iss jamaat kay baray mein kiun nahi bolta? Mujhe Khak main mela kar meri khak bhi urra de. I solute u Mr. Qadri for this gr8 act of bravery and for proving the love for our beloved Prophet (S.A.W). God bless u.. N May Allah almighty give us all the true love for Allah almighty, His Prophet (S.A.W) n Islam. ajkal kay nafsa nafsey kay dor may tu nay bahdri or sabbr ki mesal kaym ki hai. or saath hi zalim musreko ko wazih payzam di hai. the greatest personality of this century . mumtaz qadri is the best hero of this century in the pakistan. He is the Ashiq e Rosool . I regard him with heart and soul. I am Indonesian and Qadri is my hero!!! mumtaz qadri is a beast.he is blood thristy man.the people who support him are very well deserve for the country like pakistan n leader like zardari.n they truely deserve for drone attacks.thats why they are facing drone attacks. Allah aur Muhammad (S.A.W) ko ye baat pasand nahi ke kissi ko bhi qatal kia jaye. Koi kon hota hai ke Muhammad (SAW) ki toheen karay; kisi ki kia auqaat hai, aur mera khail hai ke pakistan mai, jahan 90% se zyada muslims hain, ”qanoon-e- toheen-risalat” ki koi zarurat nahi, kyun ke koi muslim aisi toheen ka soch bhi nahi sakta. ye law bananay walay khud terrorists hain kyun ke unko pata hai ke pakistani jaisay bewaqoof nation ko is law ke zarye bewaqoof bana ke kisi ko bhi qatal karaya ja sakta hai. mujhe is law ki himayat karne walon ko musalman kehte howe sharam aa rahi hai. i dont know who u are , what are your beliefs , and your faiths ??? i just want to tell you one thing , go and read QURAN , and try to understand . dont just recite it but try to understand and follow the messages . this law is in QURAN. another thing , if you are a muslim go and read IMAN-E-MUJAMIL and IMAN-E-MUFASIL , read and understand their meaning , it says if you are a muslim you have to respect all THE PROPHETS , EACH AND EVERYONE , BELIEVE IN THEM AND THE BOOKS GIVEN TO THEM BY ALLAH ALMIGHTY , BELIEVE IN ALL THE ANGELS , YOUR FATE , EITHER ITS GOOD OR BAD , AND THE JUDGEMENT DAY , WHERE THERE WILL BE NO INJUSTICE TO ANYONE . it means if you deny anything , or phrase from these you can’t be a muslim . you should respect all . but if someone says anything bad about any PROPHET , just KILL HIM/HER in-front of all the people . so they dont disrespect anyone . try to understand it , i know its difficult , and will take time but dont lose hope and try. iF I got the same chance being AT MR. MUMTAZ’S place i would have done the same thing , WITH PRIDE . because i cant bear if anyone says anything about ALLAH AND HIS BELOVED PROPHET S.A.W.W. best of luck , pray that ” ALLAH ALMIGHTY SHOW US THE RIGHT PATH WHICH LEADS TOWARDS YOU “. Mumtaz Qadri ki azmat ko salaam. Supporters of Mumtaz Qadri…. In Paradise………… N…. Supporters of Salman Taseer….. In Hell…. No Doubt……. Malik MUMTAZ QADRI and RAYMAND DAVIS both case help us to decide that what type of Muslim we are. i realy hate people not supporting MAlik MUMTAIZ QADRI. INSHAHALLAH THEY WILL BE WITH SULMAN TASEER AND RAYMEND DAVIS IN HILL HILL HILL. u r hero of muslim. u r hero of all muslim. It’s my challenge who said Mumtaz Qadri wrong that lets come and jump in the fire. I will also Jump in it and in sha’ Allah the fire will not be harmful for me and ALLAH subhanaallahuwataala will show to whole world That Mumtaz qadri are on truth. While you all groups will be die by Burning in the fire. This is my challenge lets come, if you have any power. If you have not any power then stop this propaganda you are the followers of devils and enemy of Islam and no doubts you dogs of the People of Hell.